Discussion in 'Game Design, Development And Publishing' started by joondoe, Jan 23, 2019. I'm wondering if it is possible to make 2d and 3d game in Game maker like Ori and the blind forest, this kind of stuff ? If I remember correctly, the backgrounds in Ori weren't 3d - just a particularly fancy layered parallax effect. 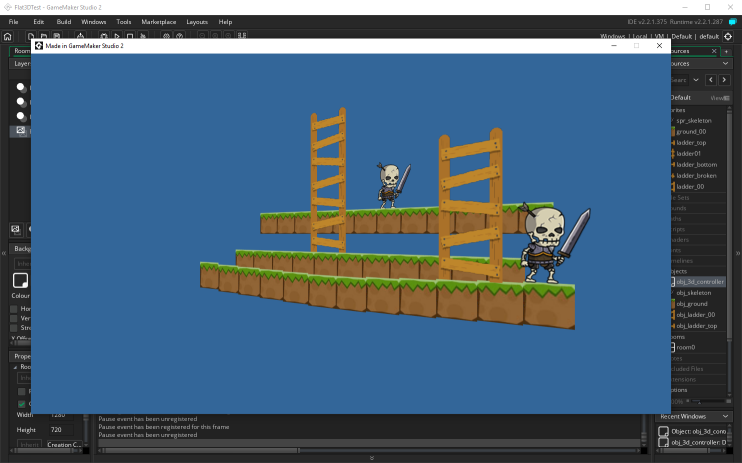 But yes, you can change projection to 3d, draw something, and change it back - via d3d_set_projection functions in GMS1 or camera functions in GMS2. okay so it's not an hacky movement if I understand well it's adapted to Game Maker features? It's not difficult to do provided you're somewhat familiar with how 3D works in GMS. I believe Ori used the same effect for its parallax effect as hollow knight. This is done by using unity's perspective (3D)camera in a 2D room. Absolutely do able in GMS2. You can switch between perspective and orthographic as much as you like during the render cycle. What is going on in your attached image is actually quite trivial to do. If I get a chance in the next few days I might even throw something together to show how this can be done in GMS2. Taddio and Niels like this. Taddio and The Sorcerer like this. That would be most awesome, this effect has nice potential! Niels and Taddio like this. Don't judge the art, just judge the technique. The three layers were placed directly in the room editor too. So it makes it easy to throw something together. Niels, nesrocks and Taddio like this. EDIT: Bro, this is just amazing! I can't believe you crammed such an amazing thing in a few lines of code in a single object, honestly. I'm definately gonna be using this A LOT. Niels, nesrocks and The Sorcerer like this. This is really cool indeed. I'll try to understand the functions better later! By the way, you seem to have two instances of the obj_3d_controller object in the room. I figure only the one on layer main is necessary? Oh is there? Must have been a mis-click. Yeah, just delete the extra one. Ah, actually I remember duplicating one of the layers when making the scene, so it must have been the main layer I duplicated and that would have gone with it. I can't figure out why the effect only affects objects on layers above the controller object's layer. Ehat do you mean? The only "bug" I found was if you go to the other side completely, the top layer STAYS the top layer, instead of becoming the back layer. I'm guessing it's possible to fix with using instances depth and one single layer, but didn't try it yet. If you add more layers in the room editor I found that the projection only affects layers that are above the controller object's own layer, otherwise they look like a regular orthogonal projection. I do this in 2D with fancy layer tricks. Directly inspired by Hollow Knight. I draw each background layer (view-sized, and from the view) to its own surface. Both tile and object. Apply a shader to it to add depth-of-field/blur and shrink it down slightly towards the center of the surface. Then I stack the surfaces and I get a nice parallaxed depth-of-fielded scenery behind my foreground. The catch is, I had to make my own rendering control object. And some some manual "on layer draw start/end" scripts for the objects. wow this is so awesome!, totally gonna abuse this technique for my next project! Yes, I found this as well when moving layers around in the layer list, etc. Seems to be a quirk GM's layer system. For something more robust, I'd certainly recommend manipulating the layers with the matrix functions.